During the month of June, this year, floods and landslides devastated the northern region of Uttarakhand, India. Is in this region where we can find the holy city of Rishikesh, a city that has been define as the “the world capital of Yoga” and, also, as the “The Gateway to the Garhwal Himalayas”, since it´s the starting point for travelling to the four Chota Char Dham pilgrimage places — Badrinath, Kedarnath, Gangotri, and Yamunotri. 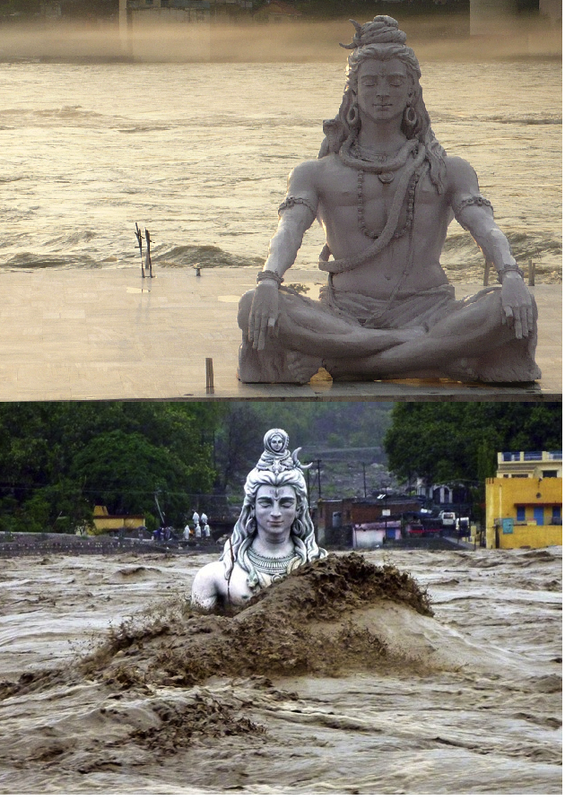 The emblematic Shiva idol was washed away by the Ganges river. My friend Kay Rush lives a couple of months a year in Rishikesh where she studies Hindi and practice yoga with Usha Devi. When all this devastation started to occur in June, she felt that maybe we could be able to help the people of this region in a different way and she invited me to be part of an NGO (Non-governmental organization) that we created together with Mahamandaleshwar Swami Abhishek Chaitanya Ji. We call the NGO Rishikesh Relief and it has for mission to provide food and basic supplies to the victims of the disaster and, also, we have the intention to help them in the rebuilding of fundamental infrastructures like schools and hospitals. After a couple of months organizing all the papers require to make this in a good way, last week we had the honor to receive Swamiji here, in his first visit to Europe, and together the three of us, we formally release the NGO here in France and Italy. Here in the Chamonix valley, we had the opportunity to listen one of Swamiji´s lectures on Yoga philosophy where he explain to us the eight limbs of yoga: the Ashtanga Yoga of Patañjali. Personally, I felt it was such a wonderful moment, where all the yoga teachers and practitioners around the valley came to listen to him… We were wound 40 people and the sensation after the lecture was of understanding, openness and gratefulness. I´m really grateful to be have the opportunity to help people in a deep way. Kay flew to Rishikesh yesterday and, once there, she will be able to see how is everything and which are the best ways to start helping the people there. I will join Swamiji and Kay in November. Please, if you want to stay in touch and help us like us on Facebook, follow us on Twitter and check our website: www.rishikeshrelief.org. And don´t forget to share this information with others!